Small-town parades are a fun part of life in New Hampshire. And with some “floats” consisting of little more than a decorated trailer, everyone can join in! Are you an electrician? Drag out the Christmas lights and decorate your truck or a (running) piece of vintage farm equipment. Own a beauty salon? Raid the local thrift store for costumes and have your staff do each other’s hair in glammed-up period styles – then toss sample packets of sunscreen or bug spray to the crowd as you march. 2) Try a farmer’s market. 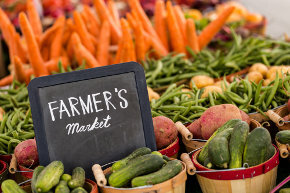 How can a farmer’s market help a real estate agent, or plumber, or computer store? It can – if you pick a local charity of interest to farmer’s market attendees and make that the focus of your booth! Offer a discount on items purchased or services booked on any day between now and Labor Day that the thermometer rises above 90 degrees. See if other non-competing businesses in the area (or in your networking group!) are interested in doing the same… and you’ll probably get some free publicity in the local paper!